We’re huge fans of traditional rice krispie treats, but sometimes we like to get a little more creative with classic recipes. 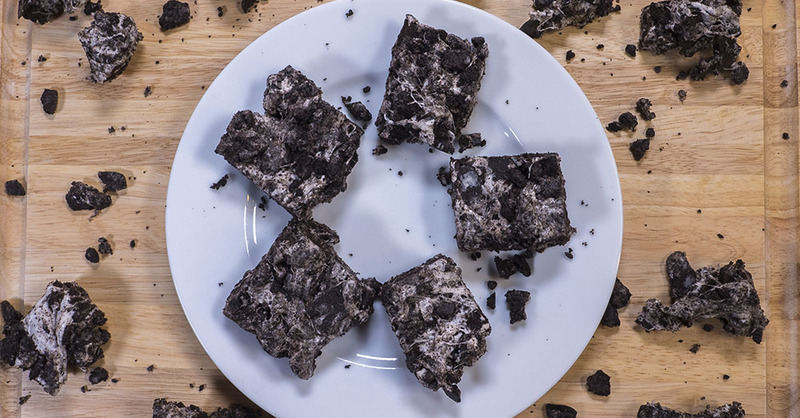 Not only are our cookies and cream bars loaded with gooey marshmallow and crunchy chocolate cookie chunks, but you will stumble upon bits of the Oreo cream filling as well – yum! These 3-ingredient treats only require a microwave – no oven or stove – so they’re not only a breeze to whip up, but are a perfect recipe for little ones to help with – we just made a batch with our kids and they had so much fun! Place Oreos in a food processor or blender and pulse until evenly ground. Add marshmallows and butter to a large, microwave safe bowl, and microwave until butter is melted and marshmallows are soft and puffy. Fold in crushed Oreos until well combined. Scoop mixture into baking dish and let set, about 10 minutes. Remove from dish with edges of foil or paper. Cut into squares, serve and enjoy!